This page is archived as of 1/20/05. It is no longer updated. Corner kicks, goal kicks, throw-ins....real soccer. 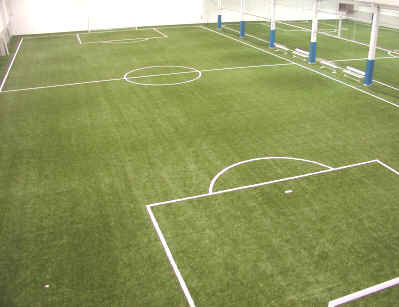 Play touchline soccer on our 2 new 175 x 81 Sprinturf fields. The winter leagues will begin play the week of November 28th. Register now as a team or individually. Register by November 12th and your spot is guaranteed. Registration after Nov 12 will be based on availability. The tournament schedule is now available! Adults players are welcome for pick up games from 8:30pm to 11pm to test drive the facility. Monday - Coed, Tuesday - Women, Wednesday - Men's A, Thursday - Men's B & Men's O-30, Friday - Open. Bring a friend. Conveniently located at 422 & Egypt Road in Oaks, PA. The is easily accessible to all soccer hotbeds in southeastern PA. Touchline soccer is now in your backyard. Check it out!! A view from above Field 1.